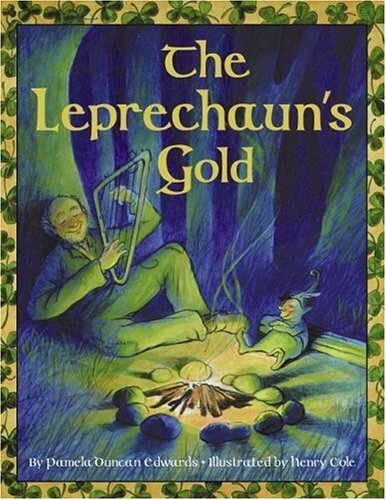 The Leprechaun's Gold, written by Pamela Duncan Edwards and illustrated by Henry Cole, tells the tale of Old Pat and Young Tom, two harpists entering a contest for the title of best harpist in the land. Young Tom knows Old Pat is more talented and sabotages Old Pat's harp by cutting one of the strings. When the two men hear a leprechaun in need, Old Pat helps out, while Young Tom continues onward to the contest. Old Pat is rewarded with The Leprechaun's Gold and Young Tom, well you'll have to read to find out what happens to him. This story received my four year old son's approval as he has already requested to read it again tomorrow. There are also hidden shamrocks in the illustrations, which my son thought was great. After finding shamrocks in this story, you can make your own shamrock prints using a green pepper, green paint and white paper. All you have to do is cut the green pepper in half horizontally as the stem is facing up. Then carefully scoop out the seeds without damaging the edges that will make the shamrock print. Next simply place upside-down on a plate.